This book has 365 days of devotions. It focuses on different themes each day of the week and starts over again the next week: Core, Family, Friends, Potential, Mission, Influence, and Faith. This book is written in a way that you can start in on any day of the year and keep going until you get back to where you started. The Giveaway has ended. Please like us for more great Giveaways. Continue reading for the rest of the review and a Video. Each day starts with a bible verse and follows with a life story that relates. I am not into sports other than play offs and still enjoyed the stories although I believe that the man in your life who loves sports would relate well to this book. At the bottom of each page is an Uncommon Key – This is a conclusion of the life lesson to be learned. It is sort of like how the point to an Aesop’s fable is at the bottom of a story. The main point of this book is the best part, a challenge. Men love a challenge. Am I Right? The challenge is simply to put god in your life everyday . Some things that I have picked out that you can learn from this book are integrity, self control, patience, generosity, thankfulness, to be there for our families and how much we can influence others lives around us. If you want a book to give the man in your life to encourage him to put more time into god this would be that book. If your significant other does not read I would recommend the audible version of it that can be found here . The reason I say that is because my husband does not read so I buy him audible books. I believe that reading is how we fill our head with positive things to encourage us to take action in our lives to become a better person, the person that god wants us to be. I believe Tony Dungy has written this book in a way that is capable of just that. I wanted to add a little something I found about the author of this book. James and I have something in common with Tony Dungy. He has 8 children also. To see an interview on his adoption please go here. 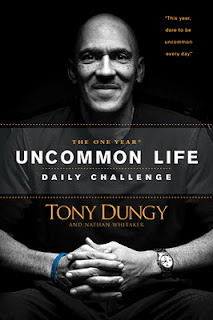 Link >> Adoption Interview with Tony Dungy How blessed those children are when someone like Tony and his wife find it in their heart to save a child from an uncertain life and give them a loving Christian home. Disclosure: I received a copy of this book in exchange for my honest opinion. Thanks nice blog. I added you too! Thank you so much it is my first one since I am new.